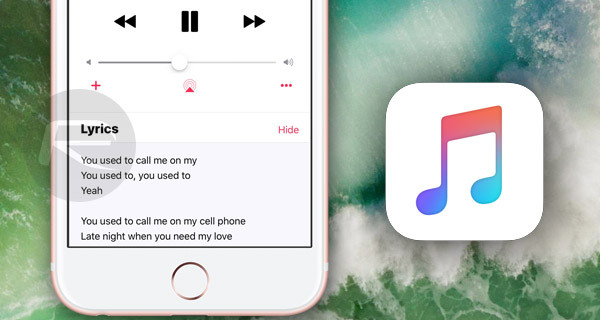 Here’s how you can access and use Apple Music Lyrics feature in iOS 10 Music app on a compatible iPhone, iPad or iPod touch device. With iOS 10 having rolled out to public just this week, the revamped Apple Music and Music app experience have come as a surprise to many – for some in a pleasant way, for others not so much. 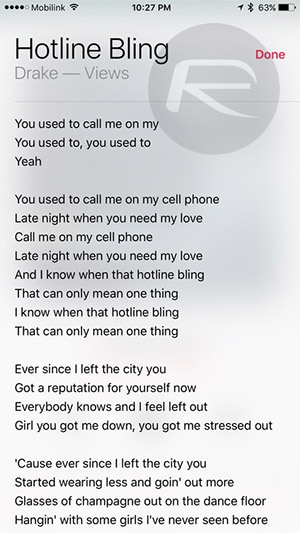 Part of this revamped experience is the new Lyrics feature built right into the app, but it isn’t exactly placed front and center in the Music app’s interface. Before we move onto how you can access the feature, it is important to note that this feature is only available to Apple Music subscribers. It won’t work with your existing library of purchased songs from iTunes. Secondly, Apple is still in the process of adding lyrics to songs and albums in its database which means not all tracks and albums have been updated with lyrics support just yet. So if Apple Music is a service you rely on for your music needs, here are two ways of getting up and running with this new feature in no time in iOS 10. Step 1: To begin, launch the Music app and play your favorite track, or well any track from Apple Music service (not iTunes purchased songs). 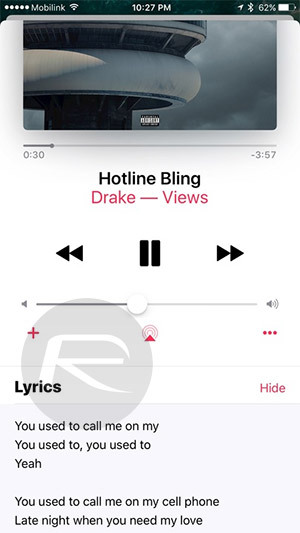 Step 2: From the main Now Playing screen, simply swipe up to reveal a subtle menu of sorts, displaying the “Up Next” feature, as well as the Lyrics option (if available for that song). Step 3: Tap the Show button next to Lyrics and you will see the lyrics for that song appear in that menu. You can slide that menu up to expand the Lyrics card as well and also scroll through the lyrics by swiping up and down within the card. Tapping Hide will close the card. 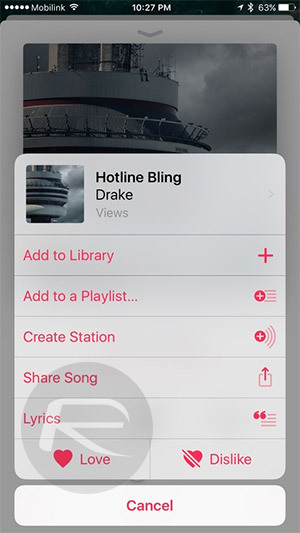 Step 1: Launch the Music app followed by playing any song from Apple Music. Step 2: You will notice a button in the bottom right corner denoting ‘three dots’. Yes, tap on that once to bring up an overlay menu. Step 3: Here you will be seeing a bunch of options relating to the track you’re listening to, such as “Download”, “Add to a Playlist…”, etc. You will also see the Lyrics option at the bottom, so as you must’ve guessed by now, tap on this button. The lyrics will now be displayed in a translucent card atop the song card, which you can scroll through as well. If you wish to close the lyrics window, simple tap the Done button on the top right corner.